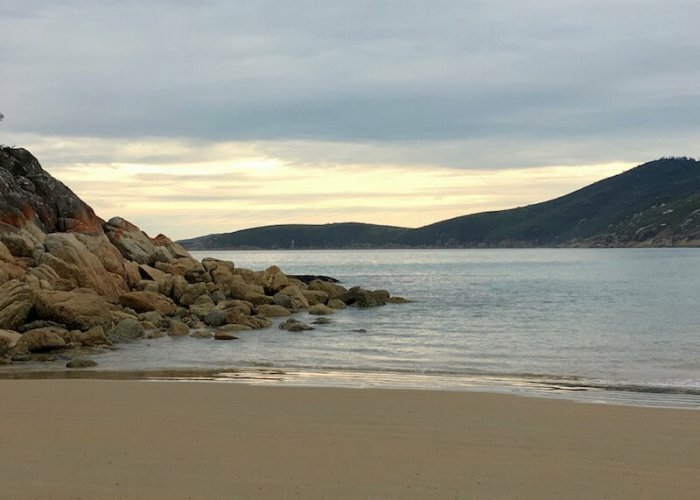 Wilson’s Promontory is one of those special places on earth you dream about. Following the signs to Wilson’s Promontory, the road winds around flat marsh areas, with markers posted to show the way to various bush tracks. It’s sorta humdrum until you traverse the mountain and turn the corner to witness a scenery that is so breathtakingly beautiful, it looks to be out of a movie set. We have been to New Zealand and Hawaii, along with various parts throughout Australia, that match these kinds of views, but being nature lovers, we were in heaven. 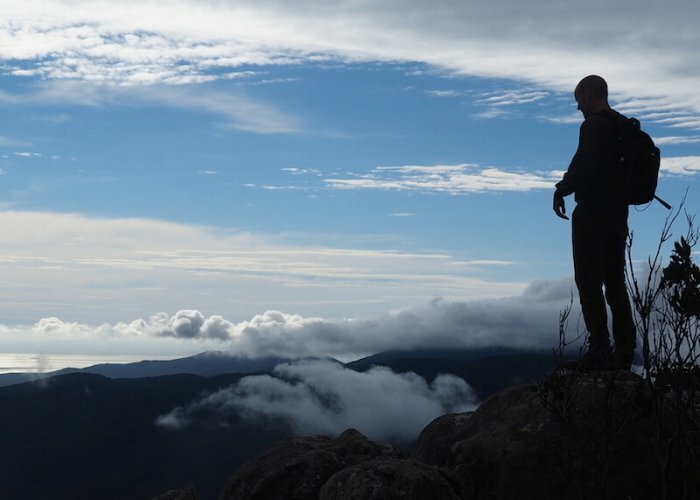 Wilson’s Promontory has stunning views, but it’s equalled with amazing bushwalks and wildlife too. You feel like you are a part of the landscape. 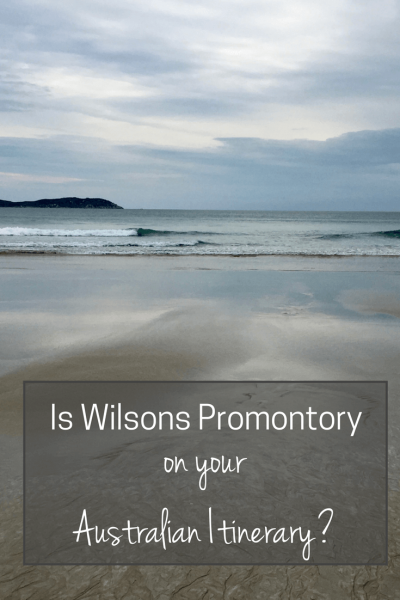 I had read about Wilson’s Promontory over the years. It’s described as a Mecca for camping. Everything I read raved about it. 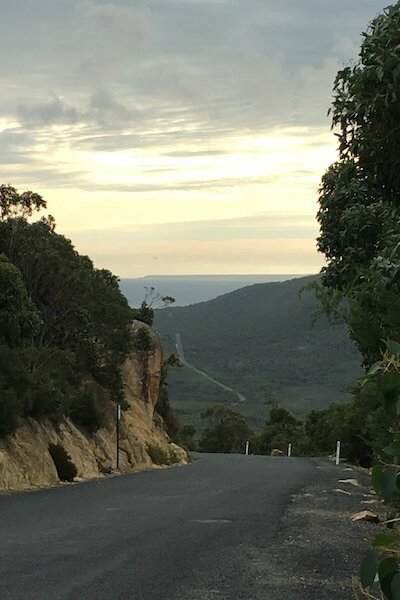 It was one of the first places I put on our itinerary when we started planning our 10 month (re) Discover Australia road trip. I’d been itching to get south to Wilson’s Promontory to see it for myself. It’s located on the very southern tip of the Australian mainland, in south-eastern Victoria–about a 12-hour drive from Sydney. The N.S.W. South coast was the furthest we’d been camping to date. The Prom, as the locals call it, was just too far from Sydney for a weekend trip. 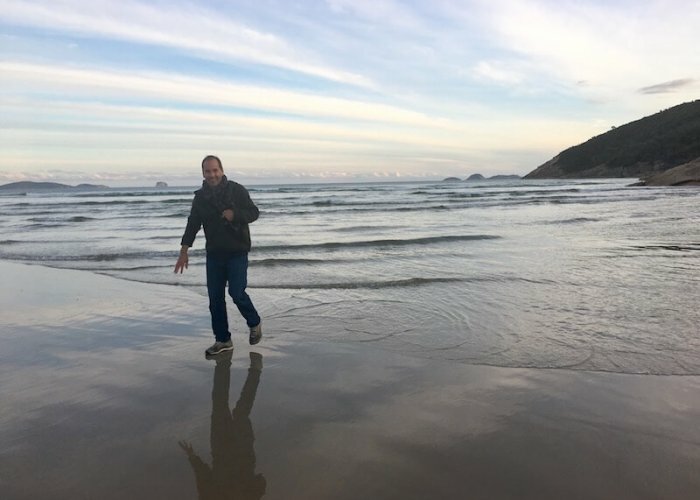 When Natalie was still at home, school holidays were our only opportunity to get away, and that’s when Wilsons Promontory is generally fully booked, sometimes up to a year in advance. During high season, which is December – January in Australia, there is a ballot for those interested in camping at Wilsons Prom. No favouritism allowed. Yes, it’s that popular as a destination, especially for Victorians. At three short hours away, it’s practically in Melbourne’s back yard. 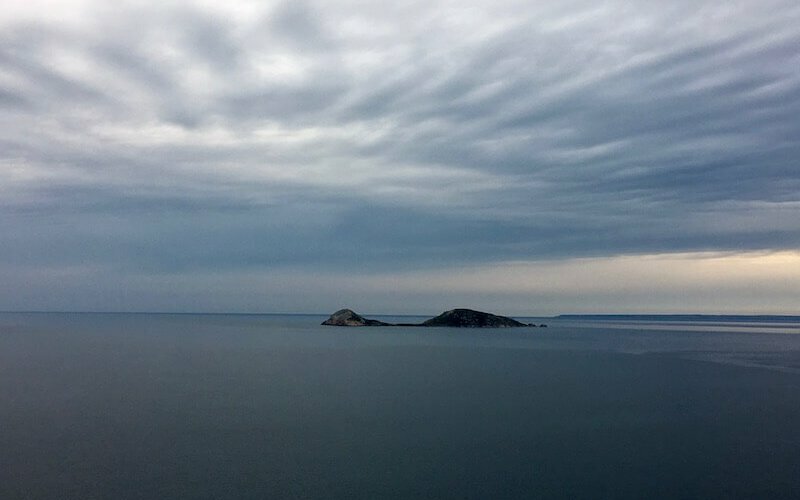 Wilson’s Promontory is usually on the itinerary for many travellers taking the Sydney-Melbourne road trip. In fact, when we started our road trip, an English traveller camping next to us at Potato Point told us about the abundance of wombats there. Amazingly, Rich had not seen a wombat (that wasn’t roadkill) in the four years he’d lived in Australia, so we were even more eager to make it to Wilsons Promontory. Harry the Wombat on the move! Since it was late Autumn, early Winter before we made it to Wilsons Prom, it meant camping would probably not be feasible. Not in a tent anyway. The weather forecast called for cold, windy, and wet. We love camping, but if it’s windy, I’m not a happy camper at all. I can deal with rain and cold, but not wind. So, we booked a cabin. The living room doors folded completely to bring the outdoors in, opening the space right up. The windows in the bedrooms opened up completely as well so it felt as if you were sleeping outside. But it also had a heater you could turn on with a switch, hot water that you didn’t have to light a fire to achieve, and doors you could close, but still see out of. Even if the weather hadn’t forced us inside, I still believe these cabins are a luxury one should indulge in once in a while. When the storm did hit during our stay, we were thankful we had booked the cabin. It felt like the wind was going to pick us up and whirl us from Oz to Kansas and back. It was only the next morning, on our usual walkabout, we saw how severe the storm had been. A couple of big trees and several large branches littered the grounds and someone had even been airlifted out. I have to admit though, prior to the storm, I looked at the off-power campers with a little envy. At that far end of the campground, where the non-powered sites lay, it was practically empty. My type of camping. Well, except for the couple on the opposite end of the same camping area, down at the powered sites, who decided to play movies at full volume one night and music at the same decibel the following night. Ah yes, camping with the douchebags. It should be a movie title, yes? We were just glad to be away from the nonsense and cosied up in our cabin. During the days, we were up with the sun and wandering. The photographer in me had itchy fingers the entire time I was there. Between the beaches, the surrounding mountains, the creek and the vistas, there was a lot to photograph. I love it when you can get out of bed, throw on some clothes, grab the camera and be out before the sun peaks the mountains. You become one with nature at that hour. As I walked toward the bridge, I ignored the two other photographers, testosterone on high as they compared photography equipment. With a smile and a good morning, I left them to it. I had more important things to do. You know, like take photographs. With my much loved Olympus, I knew from experience that my photographs would be equal to theirs. They could boast all day long about their massive lens, robust tripods and expensive camera bodies. Great pictures come from the eye, not the equipment, although I will admit (to you) that my camera did not come cheap. But it’s light, compact, takes amazing shots and worth every single cent. The bushwalks around Wilsons Prom are what hikers live for. In one day we walked around headlands, exploring three separate beaches, including Squeaky Beach and Whiskey Bay, picnic included. It was the perfect day out. Another day of hiking had us reaching the summit of Mount Oberon. While it was a push for these old bones, the 360 degree views from the top were spectacular. I’ve never seen anything like it before. When the clouds rolled in, hitting the mountain and surpassing the peak, sneaking their way around–it was like being in another world. We stood higher than the clouds. 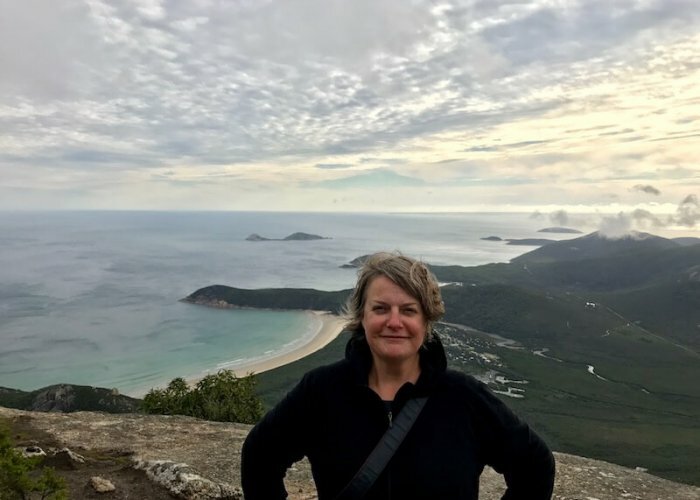 However, someone needs to tell the rangers at Wilson’s Prom, or at least that ones who make the guides, that it takes more than an hour to hike Mount Oberon. We took more like three hours there and back. Thankfully Rich agreed that the guide is wrong in stating ‘one hour’ since you need at least an hour at the top just to take it all in! Wilson’s Promontory was everything I’d imagined. More, to be honest. I had imagined remote camping and it is certainly that. The last thirty minutes from the nearest town takes you through coastal scrub and sandy plains before arriving at the grounds. What I didn’t imagine was how breathtakingly beautiful it was. I can see spending a week here. Hell, I could spend a month here and be perfectly happy. The drawback, because paradise does come with those unfortunately, is the cost to stay. Our cabin was definitely a stretch for our long-term travel budget. Tent camping is even excessive in cost. It’s rumoured that the locals are speaking out at how outrageously expensive it is. One poor Uni student posted online how he wanted to take his girlfriend camping, but he’d have to save for a year just for a weekend of camping in an unpowered site. Yeah, it’s not cheap, even for those with the funds. But, for a few days, I think it’s worth the price of admission. There are short walks and there are day walks. We recommended you take drinking water, wear sturdy walking shoes and definitely take a camera. Starting at the Tidal River footbridge, this walk offers spectacular coastal views as it climbs up and over the headland that separates Norman and Leonard Bays and descends to Squeaky Beach. And yes, the beach is really squeaky! The highest point between Norman and Leonard Bays. A short side track leads to the Quiet Place, a special area dedicated to rangers worldwide who have lost their lives in the line of duty. The walk begins at the start at the Tidal River footbridge. This spectacular walk offers the fully experience of both land and sea. Travel alternates between track and beach walking. We recommended you take drinking water, a picnic lunch, wear sturdy walking shoes and definitely take a camera. Time: 5 hours return, depending on how much you explore the beach, the rocks, the trails. Starting from the Telegraph Saddle car park, this walk follows the management vehicle track up Mount Oberon. It meanders back and forth which doesn’t seem steep, but after a few switchbacks, you’ll be glad to see the offered benches. Take your time and be present in your surroundings. When you reach the top, steep steps below the rocky summit lead to postcard perfect, panoramic views over Tidal River, the coast and offshore islands. Beware of unprotected cliffs. There is a steep drop so we would not recommend taking children or anyone who is unstable on their feet. We recommended you take water, snacks, wear sturdy walking shoes and layer (even in summer months the summit can be windy, cool and clouded.) and definitely take a camera. 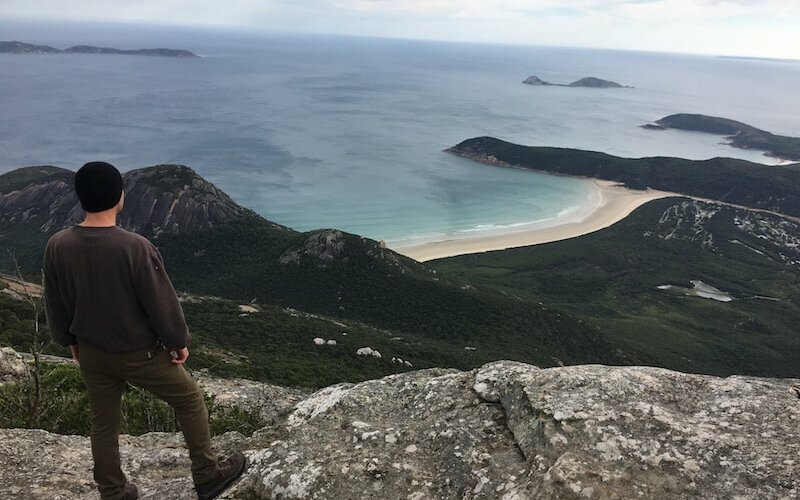 There’s never a bad time to go to Wilsons Promontory, but if summer is your goal, you need to apply early to be considered for the ballot draw. 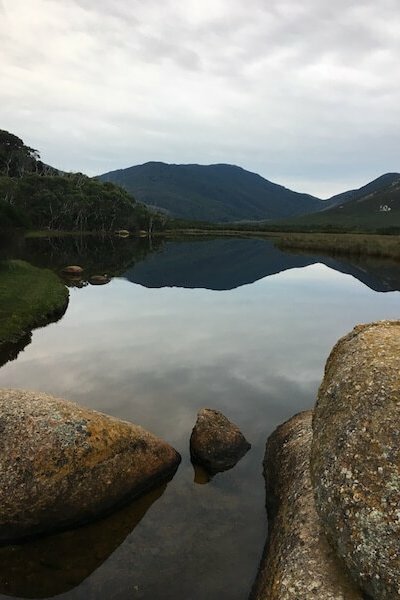 According to the Victorian Parks website, the ballot is held in June for booking Tidal River camping and accommodation (except Wilderness Retreats) for the period from late December until late January. Minimum stays apply (7 days). There are a number of accommodation options at Tidal River, which is the area we stayed and recommend. You can camp off site (away from the National Park) for a more cost effective stay, and drive into the park each day. However, we do recommend you stay at Tidal River for the access and experience. For the latest prices and availability, check out the Parks Victoria website. We recommend the Cabins, which accommodate up to six people when it’s on the cool side or for longer stays. They feature natural light and a timber deck area for outdoor relaxation. They also offer a full bathroom, fully equipped kitchen with microwave and fridge, a queen bed and two sets of bunk beds. Facilities in two cabins – Sheoak and Wirilda – are suitable for people with disabilities. The one room huts can accommodate either four or six people in bunk beds. Guests provide their own linen, blankets, pillow and towels and make use of the nearby campground ammenities. 4 burner stove with oven/grill. Linen and towel hire is available on request. Next Post 10 Reasons Why Having An Empty Nest ROCKS!